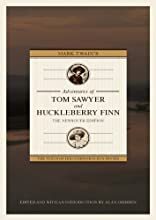 In a radical departure from standard editions, Twain's most famous novels are published here as the continuous narrative that the author originally envisioned. More controversial will be the decision by the editor, noted Mark Twain scholar Alan Gribben, to eliminate the pejorative racial labels that Twain employed in his effort to write realistically about social attitudes of the 1840s. In his detailed introduction, Gribben points out that dozens of other editions currently make available the inflamatory words, but their presence has gradually diminished the potential audience for two of Twain's masterpieces. "Both novels can be enjoyed deeply and authentically without those continual encounters with the hundreds of now-indefensible racial slurs," Gribben explains. About Dr. Alan Gribben (Editor) : Dr. Alan Gribben is a published editor. A published credit of Dr. Alan Gribben is Mark Twain's Adventures of Tom Sawyer and Huckleberry Finn: The NewSouth Edition.